National Geographic magazines are fun periodicals full of interesting information, vivid pictures and facts about various topics. When considering the sale of a collection or looking for information about the worth of a personal collection, valuing the magazines can take a little time and research. According to National Geographic's website, the magazine has been inspiring the world since 1888. The magazine covers a wide range of topics, including nature, science, technology and photography. DT Magazine explains that the magazine only started monthly circulation in 1896 and, in the years before then, only nine issues were published. Organize the magazines. 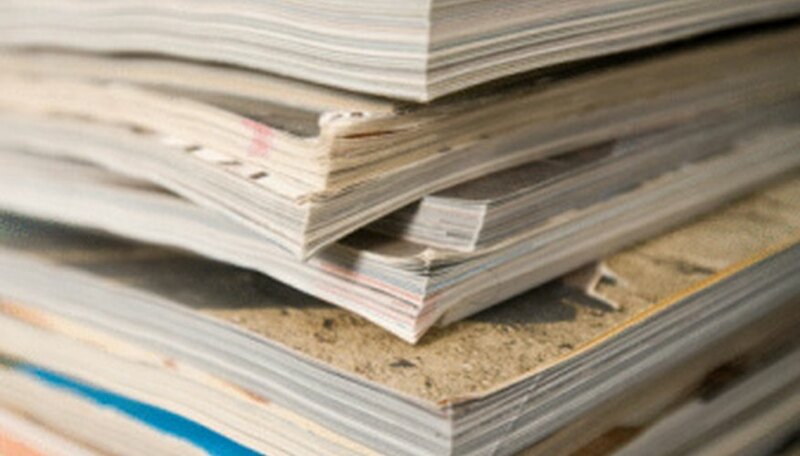 Take out any magazine issues with mold, tears or damage from age. Set the magazines that are in good condition aside as potentially valuable. The oldest or rarest National Geographic magazines are sometimes valuable even when they are damaged, but magazines that are newer and widely available are often less valuable when damaged. Go to National Geographic’s Collector’s Corner and click on the Collector’s Forum. Write a post about which National Geographic magazines are in the collection and request information from the dealers about potential buyers or values of the magazines. Pay attention to replies from the dealers. Newer National Geographic magazines are not as valuable as older ones, but value will often depend on whether there is someone looking for a particular issue or not. If none of the dealers are interested in the magazines, ask about potential buyers the dealer might recommend. Buyers are the collectors who often will pay higher amounts, especially if the magazine issue is out of print and not available. Try looking on online auctioning websites. Websites like eBay are a good option to watch current prices, especially for the older collections that are more rare. Pay attention to prices set by others for collections and the years of the collections. The older the issue, the more valuable the magazine becomes. How Much Are Old Life Magazines From 1960 Worth?